With us all trying to have a greener outlook to reusing shopping bags, Trolley Bags are are a great invention made specifically for use in a large supermarket shopping trolley. I was sent a set to try out and couldn’t wait to give them a go. As I tend to use shop & scan when I do my larger shop, I thought these would be ideal to for packing the shopping as I go around the store. 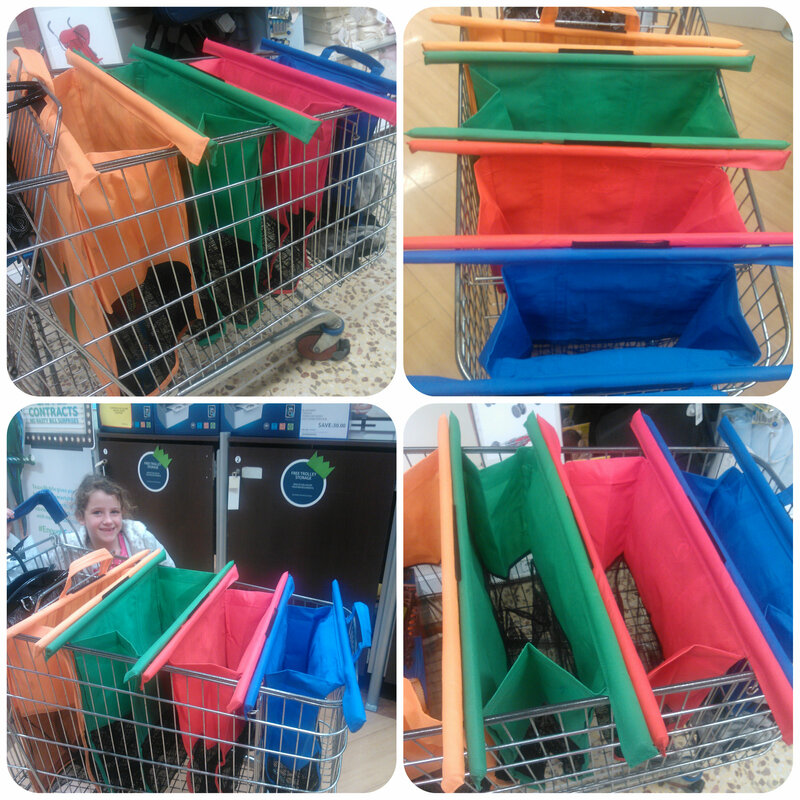 The set of Trolley Bags consists of four differently coloured bags that are velcroed together and can be rolled up for storage in the car boot. 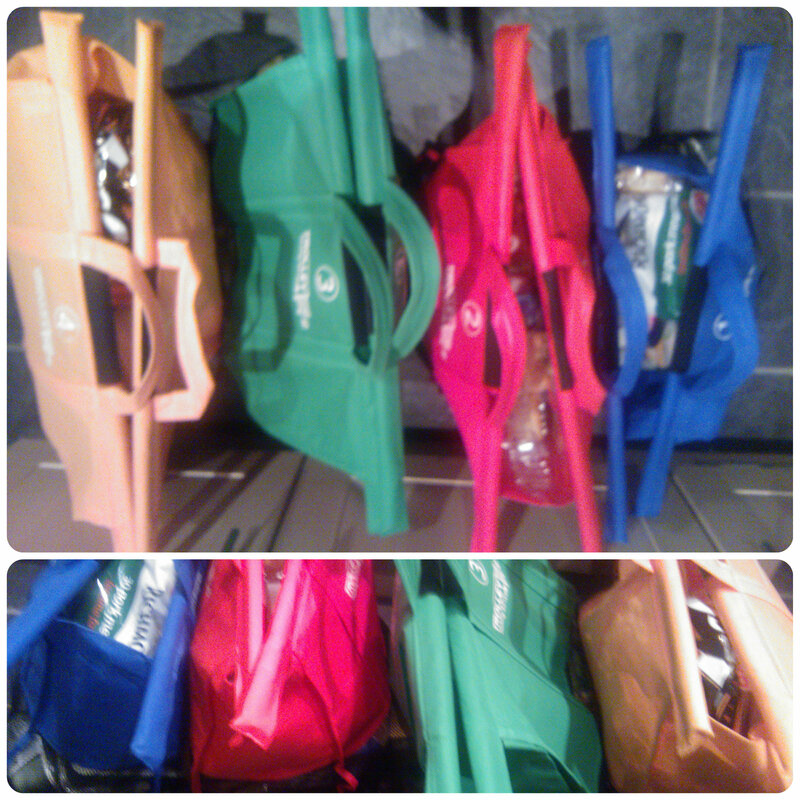 The bags range in size to fit with the slope of the trolley. The smallest bag fits either just before the separate section at the end of the trolley or if you prefer to have the seat down as I do, it will sit in the end section allowing you to use the seat area for your handbag and other items or a small child. It is best to put bulkier, larger items such as cereal boxes, crisps etc in the larger bags otherwise they will be quite heavy to lift, and keep the smaller two bags for heavier items such as tins, jars and heavier vegetables. I have found these really good for packing my trolley as I go around the shop using self scan leaving me with just four bags to put into the car. The bags hang open making packing simple, it really does result in no hassle shopping. I do have one concern though, the bars that hang off the sides of the trolley are at a similar height to my four year old’s head. I found when shopping with him in tow, he hovered all around the sides of the trolley eager to help and I found I had to be a little cautious to ensure I didn’t poke him in the face. I therefore now save these trolley bags for when I do child free shopping, or they’d also be ideal if you have a little one that still sits in the trolley seat. Overall, I think they are a great concept and definitely the way forward in shopping bags. I also like the way they velcro together making carrying them easier rather than a stash of smaller carrier bags. I’d keep your eye out for these, especially with the carrier bag charges due in England later this year! This entry was posted in Reviews and tagged eco, green, grocery bags, reusable, shopping, shopping bags, supermarkets, trolley bags by Fiona Martin. Bookmark the permalink. It is same with us. I’m afraid of the pole poking onto other when I’m close. But it is a great durable bag! I love them! I haven’t had any problems with eye poking yet, however, my daughter still sits in the trolley seat! Nicki recently posted…A bit of sale shopping. peut on en trouver en France ? what a great idea these bags are. especially now we pay 5p for plastic bags. What a FANTASTIC idea! I work in Waitrose and so many people get annoyed when they get to the till and forget they have to pay for bags now. These would be fantastic! This is a great giveaway prize and would love to try them. I always try to recycyle as much as possible. I have read your review, love the idea one bag to carry, but a bit concerned about the end of the poles can stick out. FANTASTIC PRIZE, are they sturdy enough to carry lots of canned dog food??? Wow Would love to win this for my son and his lovely family.